This week for Iron Craft Susi challenged us to do something with a t-shirt. I have to admit I was a little stuck this week, I just couldn’t think of what I wanted to do. 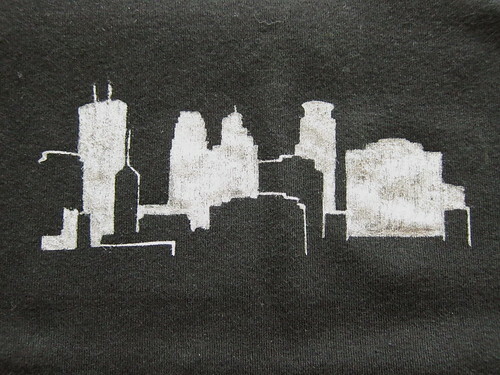 Then Matt suggested I do the Minneapolis skyline on a shirt like I did with this pillow except paint it on instead of embroider it. I know it’s a little lame using the same pattern I did for another challenge but, we can’t all be super creative every week. Plus, it was a busy week for me with a baking for Share Our Strength, a garage sale, getting sick from said garage sale and lots and lots of garden work. But enough with the excuses and on with the project. I had originally planned to trace the pattern on to the t-shirt using dressmakers tracing paper then draw over that with a fabric paint pen. That did not work at all! The tracing paper just wouldn’t work with the stretchy t-shirt fabric. So, I reverted to my old friend freezer paper. Use the Exacto knife to cut out your design. I cut some buildings out in whole and others I just did the outline. Take your time with this, the outlines can be a little tricky. Figure out where you want the design on your shirt. It might help to put the shirt on while doing this. I then pinned it in place. Iron the freezer paper stencil on the shirt, shiny side down. Make sure it it completely stuck to the shirt especially around the details. 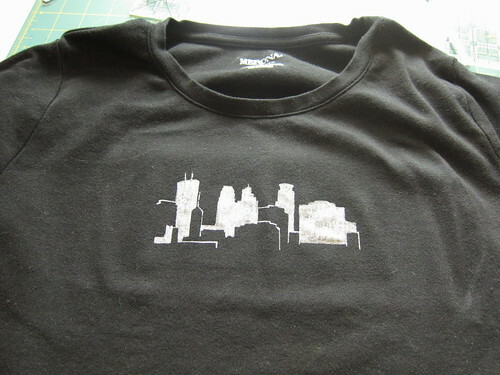 Put a piece of paper or cardboard between the two layers of the shirt under the stencil so the paint doesn’t bleed through. 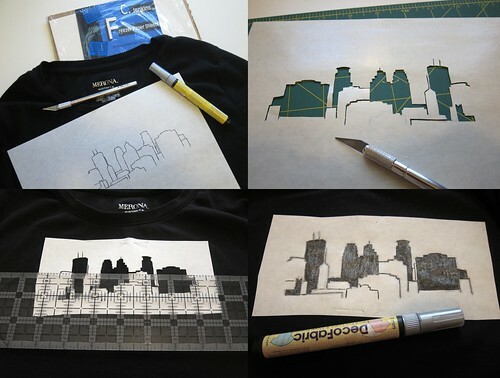 Use the fabric paint to carefully color in the stencil. With a pen there is a little less chance paint bleed under the stencil but, it pulls the fabric a little. Let the paint dry then, carefully remove the stencil (you can probably use it one or two times more). 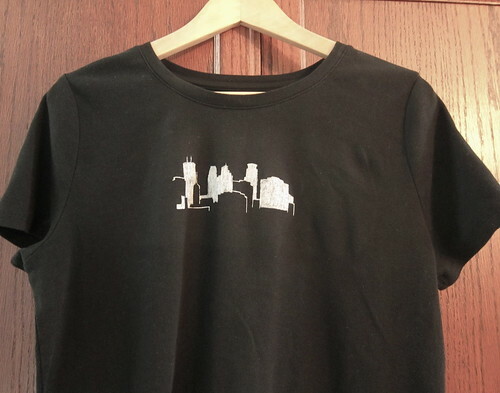 Let the t-shirt dry for 24 hours then heat set the design with your iron. Not "lame" at all!!!! super sleek and cool!!! I LOVE it. It is your original art!